From the developers behind the award winning game of Google Ingress comes a well-known monster catching game that hit Nintendo devices across the years as we are brought with the upcoming Pokemon Go. The company with the same name as the upcoming game (sans the “Go”) has just recently announced that they are already in collaboration with Nintendo and Niantic to produce the mobile game. The game, that is planned to hit Android and iOS devices by next year, will follow in the footsteps of the already popular mobile game, Ingress. 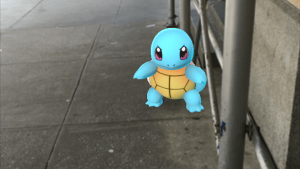 With Pokemon Go, players are able to catch these cute pocket monsters out on the real world, and even do battle with them. Along with the game itself, Nintendo is already developing a smartwatch companion that will go with the Pokemon app. This gadget will be called Pokemon Go Plus and it is designed to help you take your first steps into becoming a full-fledged Pokemon trainer. Also, the watch is made so that users do not have to stare at their mobile device all day long looking for cute monsters to catch. The Pokeball-shaped watch will vibrate and also give out a light when you are near a Pokemon while you’re out in the real world. This project has long been in the works with Tsunekazu Ishihara, CEO of The Pokemon Company, and with the late Nintendo CEO, Satoru Iwata. Ishihara stated in a press conference that the game has already been in the works for around two years. This new Pokemon game will be available on the year 2016, which is also 20 years after the first Pokemon games were released. The mobile game itself will be free to download and play but there will be various in-app purchases available for trainers that want a bit more edge when catching their favorite monsters. While the game is free, the smartwatch is not. Pricing for the Pokemon Go Plus has not yet been revealed as it is said that it has not yet been finalized. The trailer for Pokemon Go also shows that trainers can band together in defeating and capturing a more difficult adversary. It was shown in their trailer that many trainers helped hand in hand with their Pokemon partners to defeat the ever powerful Mewtwo. More information should be available to the public when developers are able to progress more into the creation of the game.